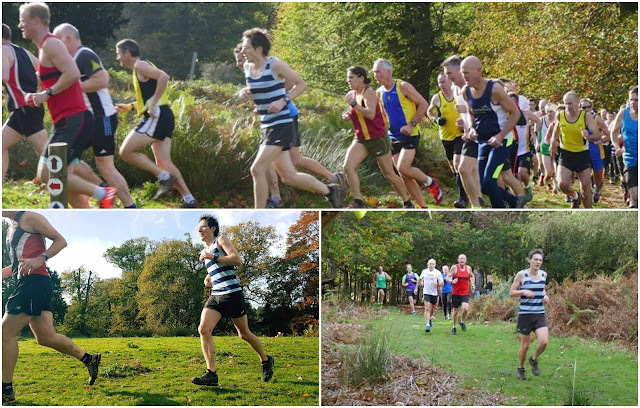 The 2017/18 Kent Fitness League cross-country season got underway at the stunning Knole Park in Sevenoaks. For details on car parking, toilets and an in-depth course description please have a look at my main Kent Fitness League information page or my blog post from 2016's race. The run up to the race had been pretty good, topped off with a sub-20 5k at Southwark parkrun just two weeks before the race - this meant I was in roughly the same shape (if not slightly faster) as I was a year earlier. 2017's event saw slightly fewer participants than the record-breaking 2016 event, but there was still a very high turnout of 493 participants. At the starter's orders we all shot off on our first KFL outing of the year. I had already had a decent warm-up and flowed with the pack as we negotiated the early part of the course. By the time I was nearing the top of the long, gradual incline I could feel my stomach starting to tighten. I held my pace and focussed on my breathing in the hope that I could bring it under control. It seemed ok until I hit the short, sharp downhill section at the far end of the course. At this point the feeling in my stomach changed to a stitch or possibly a stomach cramp on my left hand side, and it was the worst running pain I've ever had. My pace slowed and runners from behind started to stream past. I shuffled on, maintaining a pace, but it was not much more than what I would run during an easy run. All the way through the second lap, runners continued to catch and pass me, and there was nothing I could do. The pain was too intense. Then, with about a mile left in the race, another pain which felt more like a traditional stitch appeared on the right hand side. I had no choice but to stop and walk - I strategically picked the incline into the woods to do this so as to lose less time than on the flat. At the top of the incline I shuffled back into a run and before I knew it, I had completed the last kilometre and crossed finish line. I was handed finish token number 146, which is my worst ever KFL finishing position. After looking forward to this race for so long, it was a huge disappointment that it panned out how it did. However, I mustn't linger on it and I suppose I should be happy that I finished only about two-and-a-half-minutes slower than in 2016 despite the horrendous race I'd just had.